Glaucoma is characterized by irreversible optic nerve degeneration and is the most frequent cause of irreversible blindness worldwide. 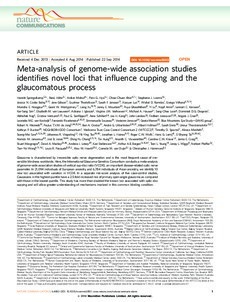 Here, the International Glaucoma Genetics Consortium conducts a meta-analysis of genome-wide association studies of vertical cup-disc ratio (VCDR), an important disease-related optic nerve parameter. In 21,094 individuals of European ancestry and 6,784 individuals of Asian ancestry, we identify 10 new loci associated with variation in VCDR. In a separate risk-score analysis of five case-control studies, Caucasians in the highest quintile have a 2.5-fold increased risk of primary open-angle glaucoma as compared with those in the lowest quintile. This study has more than doubled the known loci associated with optic disc cupping and will allow greater understanding of mechanisms involved in this common blinding condition.